How many times have you looked through the new Holiday Catalog? My catalog is looking a little tattered and slightly worn at this point. 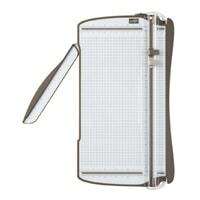 But, I am very embarrassed to say that I overlooked the gorgeous Wishing You Well stamp set until recently. A dear friend of mine and a fellow demonstrator, Anita, pointed the stamp set out to me in a recent conversation about the catalog! I strongly recommend that you add this stamp set to the top of your wish list. 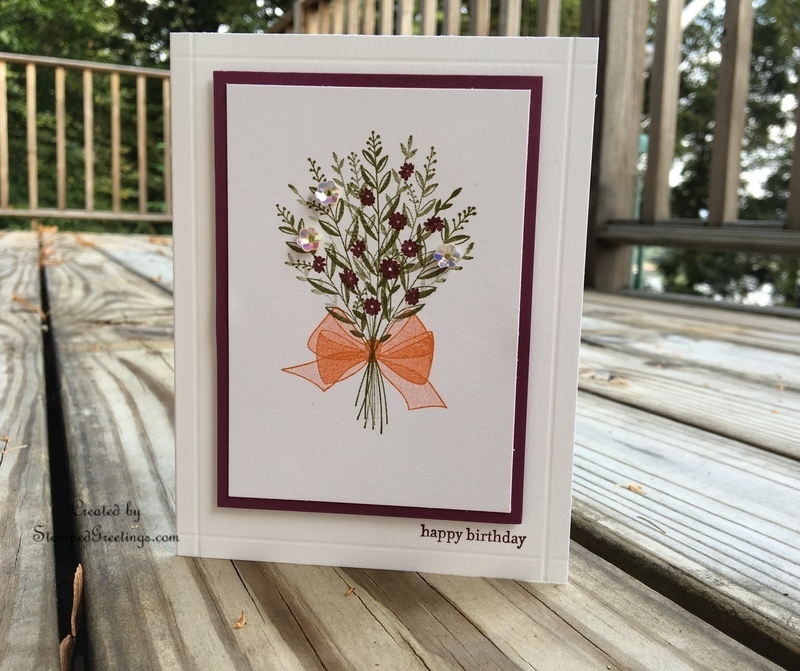 To convince you, let me share a simple, elegant birthday card that I made with the Wishing You Well stamp set. Now, that I have your attention – Let me share a few tips to make the card. 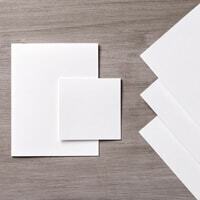 The card base is Thick Whisper White card stock cut to 5 1/2″ x 8 1/2″, scored at 4 1/4″ on the 8 1/2″ side. 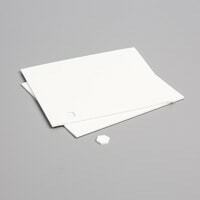 Confession – I initially scored the card at 4″ rather than 4 1/4″. But, I decided to make the design using my mistake! You’ll notice that I scored each side of the card at 1/4″ from the side. The back of the card is also scored the same way to give a little more character. It is so much fun to figure out how to make mistakes part of the card! 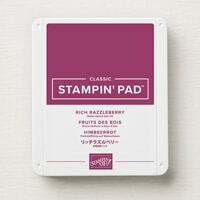 Cut a piece of Rich Razzleberry card stock to 3 1/4″ x 4 1/2″. This will be the frame around the main focal point. 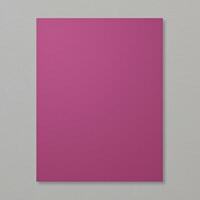 Cut a piece of Whisper White card stock to 3″ x 4 1/4″. This will be used to stamp the focal point. 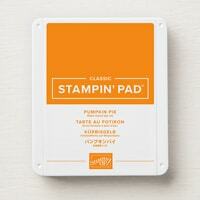 Grab your Stamparatus – truly an amazing stamp placement tool! And, grab your Wishing You Well stamp set. The Stamparatus will make stamping this image a breeze. 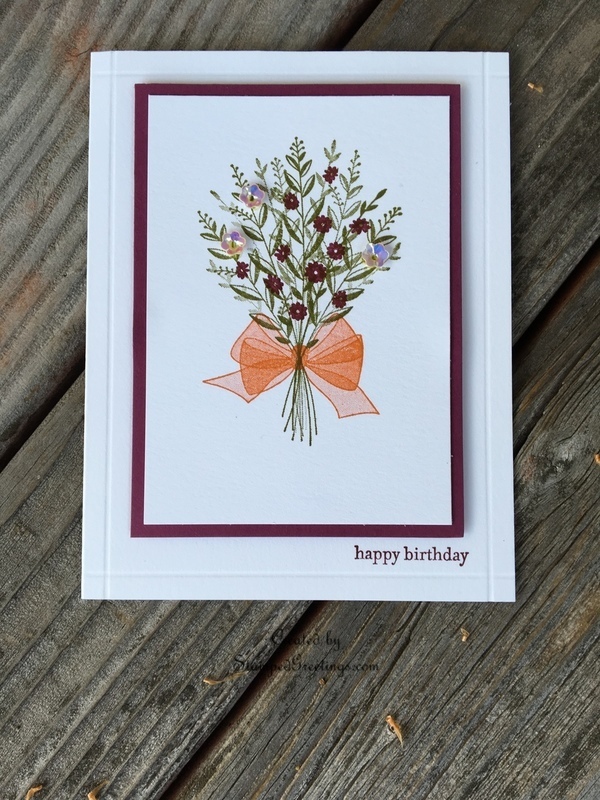 The bouquet image is stamped with Old Olive ink. The bow image is stamped with Pumpkin Pie ink. 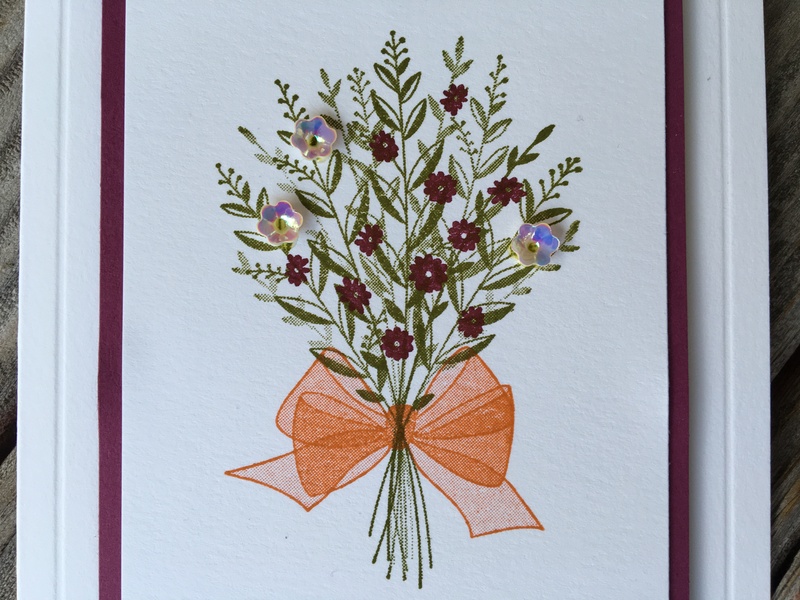 The flowers are stamped with Rich Razzleberry ink to add interest to the bouquet. Adhere the stamped image piece to the Rich Razzleberry frame. 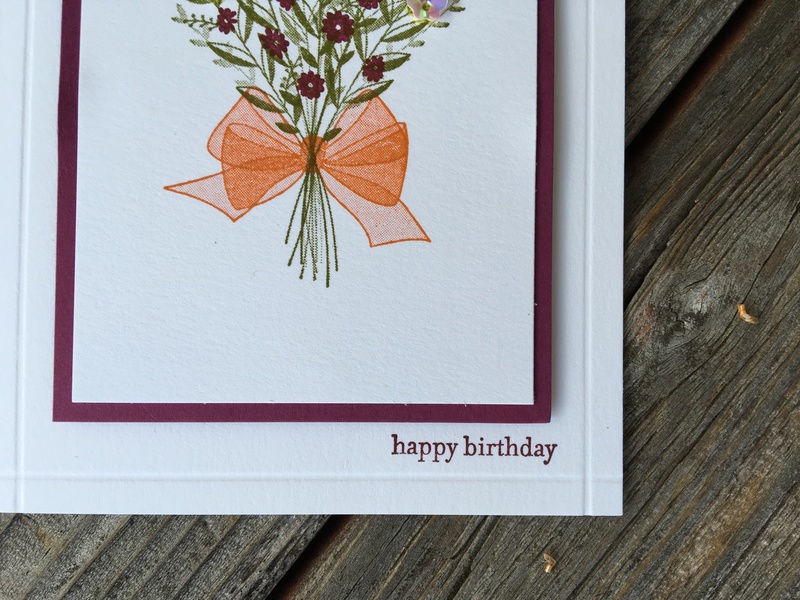 Use dimensionals to add the framed piece to the middle of the front of the card, as shown. Add a few sequins for additional interest and a little bling. Use different colors for the frame pieces, for the bow and flowers, and also for the bouquet. The possibilities are endless! 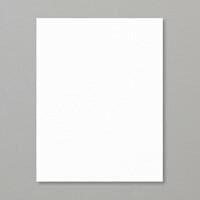 And, the type of card you can make with this layout are also endless! Yes, you can now agree — you REALLY need the Wishing You Well stamp set. And, guess what? 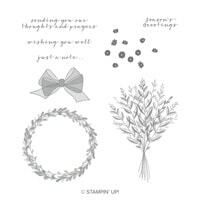 All you need to do is click on the picture of the stamp set below and place your order. Yes – it’s that easy! The other main products that I used are also pictured below. 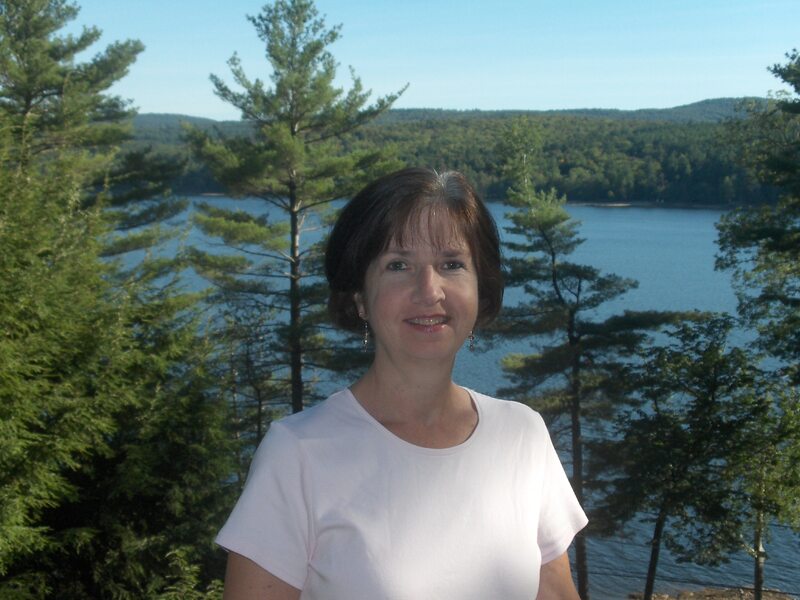 Click on any, and you’ll go to my on-line store. Varied Vases – Three Designs!